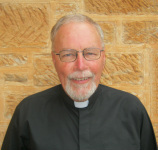 Rector: Brett grew up in Temora, near Wagga Wagga in the South West Slopes of New South Wales. As a child he attended church fairly regulary at St Paul's Anglican church but not as a teenager and young adult. It was not until in his mid twenties through the witness of Christian friends that he returned to church and had a revelation of faith in Jesus. With the encouragement and support of Christian friends and mentors he grew in his faith and had various times of epiphanies that led to ordination as a deacon and then priest in the Anglican Church of Australia. In 1996, whilst in the first year of studies at St Marks National Theological College in Canberra, he met Michelle Whitby on an overseas youth pilgrimage. They married at St Johns Anglican Church Bega January 1998. Over the years they have served in Canberra, Bermagui, Tumut, Batemans Bay, Junee, Parkes and now at Dubbo. They have four beautiful children. Brett is passionate about seeing people come to faith in Jesus and growing - and encouraging others - as a disciple of Jesus. His vision is for an alive and vibrant church (of all generations and across the denominations) through the Central West of New South Wales and beyond. He endeavours to live by the Two Great Commandments (Matthew 22: 36-40) and the Great Commission ( Matt 28: 16-20). Honorary Priest - Walkabout Ministry - Gloria was born, raised and educated in Nyngan and moved to Dubbo in 1986. Gloria was ordained Deacon in 1995 and became the first female Aboriginal Priest in 1996. Gloria is married to Eddie and they have 3 sons, 3 daughters in law, 12 grandchildren and 2 great grandchildren. Gloria is the Chairperson of NATSIAC (National Aboriginal and Torres Strait Islander Anglican Council), a member of Western NSW Anglicare and an Indigenous Ministry coordinator. Gloria's ministry is financially supported by Anglican Board of Mission (ABM). Honorary Deacon Assistant - Ray has been worshipping at Holy Trinity since 1978. He served on Parish Council for 25 years, People's Warden for the last 6 of those years. In 2007, he commenced training as a Licensed Lay Minister (LLM) and in 2009, Ray was granted his licence as an LLM, by Bishop Richard. In June 2012, after years of discernment, Ray offered himself for Ordination. Ray was ordained in September 2012. Ray is happily married to Lyn and they have two children and five lovely grandchildren. ​Pastoral Care Minister and Parish Administration - Wendy is a Licenced Lay Minister and Chaplain to the Retirement Village.